Coming from San Francisco, we took a late flight out of on United Airlines with a 2 hours layover in Houston, perfect for an early breakfast. Both portions of the flight only served complimentary drinks in coach. Food was available for purchase. Both flights also had DirecTV, though it was not free. All in all, the airfare was low frill. Once we landed and got through customs, William from William's Belize Shuttle, was waiting for us in his signature yellow shirt with our fearless leader’s name on his iPad. 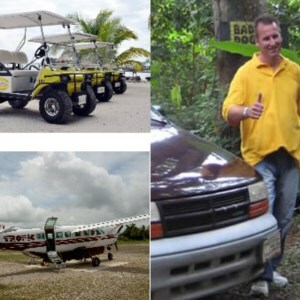 Based on stellar online reviews, we had booked his transportation services in advance to get us to our hotel from Belize International Airport to San Ignacio Resort. William had suggested we change into clothing more suitable for Belize’s hot and humid temperature, and gave us the opportunity to change before hitting the road. Along the two hour drive, he gave us an amazing adhoc tour of the sights we passed along with answering any questions we had on Belize. We asked everything from taxes, to politician, to tour ideas, to reasons why he started his transportation business in Belize. His van has complimentary WiFi along with a mounted iPad at the front to show us pictures of possible tours. He successfully convinced us to delay out flight and visit the Belize Zoo (and even guided us through the first few exhibits). He even advise us to change our flight to the small domestic airport that ended up not only being cheaper, but less headache without having to pass through security. All in all, William is a very informed and talkative person, which our party of five all enjoyed. He gave us a very detailed introduction into the culture and life in Belize. William advised us to tweaks to our trip and confirming with tour details on the way into San Ignacio, and even called to confirm a ride would pick us up at our next stop as we left San Ignacio. Since our trip was already short, about a week, I did not want to spend precious time with the public bus system. According to William (from William's Belize Shuttle), the bus system is cramped, slow, and antiquated. It's works for the locals, but is in dire need of modernization. There aren't any official stops, so people can be picked up or dropped off anywhere along the bus route. What this means is lots of stops. The buses are old school buses, without AC, and can often be standing room only. If you're looking to travel Belize on the cheap and have a lot of time, this will be the perfect option for you. We book our flight with Tropic Air to take fly us to San Pedro on Ambergris Caye. When we reserved the flights, we figured the easiest would be a round trip from Belize International Airport. After talking to William, we changed our flight to leave from the municipal airport. Since it’s a municipal airport, we didn't have to go through security screenings. Luckily, changing the flight was easy, free, and even saved us some money. The flight itself was an experience in itself. A small single propeller plane picks up six passengers and ferries us over. It’s a short 15 minutes flight, but offers amazing views on other Cayes on the low level flight. It was even smaller than the plane that we took in Bora Bora for our Honeymoon. Take-off and landing were smooth, no services on-board. Just the one pilot. All of the domestic airports in Belize had free WiFi. When in the city of San Pedro, one of the options of getting around is to rent golf carts. It would have been an experience driving around in a town of mostly golf carts, but it is also very possible to just walk, as the town of San Pedro isn't very large. If you want to venture north, past the bridge where there are more restaurants and activities, then renting a golf cart for the drive is highly suggested. People who have visited San Pedro, Ambergris Caye before suggested renting carts, but we did not have enough time. Not that the roads are bumpy and there is the occasional car or van, and lots of people walking, so you should be cautious when driving the golf cart.